H. Parametrization of principal-circle groups by multipliers. Orthogonal decompositions and twist parameters. Quasiconformal Mappings. Conformal invariants. Definitions for quasiconformal mappings. Complex dilatation. Geometry of Riemann Surfaces. Riemann and Klein surfaces. Elementary surfaces. Topological classification of surfaces. Discrete groups of Möbius transformations. Uniformization. Models for symmetric surfaces. Hyperbolic metric of Riemann surfaces. Hurwitz Theorem. Horocycles. Nielsen's criterium for discontinuity. Classification of Fuchsian groups. Short closed curves. Collars. Length spectrum. Pants decompositions of compact surfaces. Shortest curves on a hyperbolic Riemann surface with a symmetry. Selection of additional simple closed curves on a hyperbolic Riemann surfaces with a symmetry. Numerical estimate. Groups of Möbius transformations and matrix groups. Traces of commutators. Liftings of Fuchsian groups. Moduli Problems and Teichmüller Spaces. Quasiconformal mappings of Riemann surfaces. Teichmüller spaces of Klein surfaces. Teichmüller spaces of Beltrami differentials. Non-classical Klein surfaces. 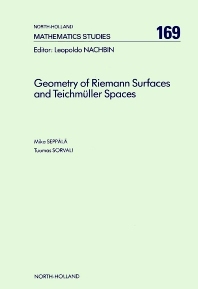 Teichmuüller spaces of genus 1 surfaces. Teichmuüller spaces of reflection groups. Parametrization of Teichmuüller spaces. Geodesic length functions. Discontinuity of the action of the modular group. Representations of groups. The algebraic structure. Reduction of parameters. Extension to non-classical surfaces. Moduli Spaces. Moduli spaces of smooth Riemann surfaces. Moduli spaces of genus 1 surfaces. Stable Riemann surfaces. Fenchel-Nielsen coordinates. Topology for the moduli space of stable Riemann surfaces. Compactness theorem. Symmetric Riemann surfaces and real algebraic curves. Connectedness of the real moduli space. Compactness of the real moduli space. Reviews on results concerning the analytic structure of moduli spaces of compact Riemann surfaces. Appendix: Hyperbolic metric and Möbius groups. Traces of matrices. Bibliography. Subject Index. The moduli problem is to describe the structure of the space of isomorphism classes of Riemann surfaces of a given topological type. This space is known as the moduli space and has been at the center of pure mathematics for more than a hundred years. In spite of its age, this field still attracts a lot of attention, the smooth compact Riemann surfaces being simply complex projective algebraic curves. Therefore the moduli space of compact Riemann surfaces is also the moduli space of complex algebraic curves. This space lies on the intersection of many fields of mathematics and may be studied from many different points of view. The aim of this monograph is to present information about the structure of the moduli space using as concrete and elementary methods as possible. This simple approach leads to a rich theory and opens a new way of treating the moduli problem, putting new life into classical methods that were used in the study of moduli problems in the 1920s.